Congratulations again. Can't wait to see where you pop up! Soooo...now that you're the confirmed winners, can you tell me where you found the second and third glyphs? 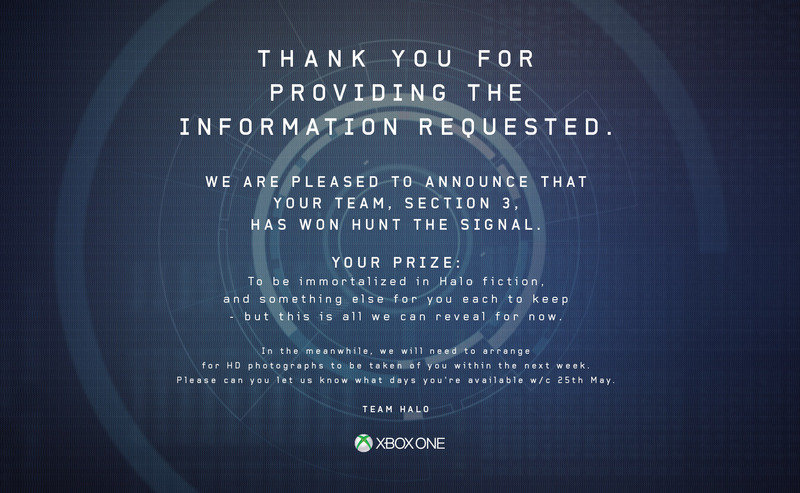 Someone shared (maybe it was you) a screenshot of the verification email where they wanted to know how you found the final 4 glyphs. Did you actually find them? It's been driving me crazy. I still want to know even though it's over. I spent far too much time on it to never find out. Perhaps there's a postmortem tomorrow? Ahh well congrats, now I can go back to actually working at work I suppose. DrawSomething...I like that. I can't believe I had to draw that stupid glyph so many times before it was accepted. I had a team member that couldn't complete it. He tried for so long, but it never took his drawings...so we never completed it as a team. He tried for over an hour, and he had the right symbol. He was so upset...and there was nothing we could do (I was on a random team and we were in different countries, so it's not like we could try it for him). I wasn't upset at him, but I am upset that the final step was drawing a symbol with your finger on a mobile device in the middle of someone's private property. it couldn't be a coded sequence of glyphs that you had to type with a limited amount of tries? This could have been done better. All that work and we couldn't finish it. Sadly, those glyphs don't appear to exist. The puzzles simply break down and can't be followed to a resolution. My solution post contains pretty much everything you need to know about the steps - there's nothing more to it than that. huh. I feel bad for the people that were supposed to input glyph 2. You all definitely deserved it. First ARG I've taken part in. Definitely an enjoyable (and sometimes frustrating) experience. Good work everyone who participated - it's all over now. Site is redirecting to the Hunt the Truth Tumblr. I had a great time working along side many of you and chatting on the IRC channel. Hope to see everyone again! Pretty awesome! Good work SepheusIX and your team! Ok here is my near perfect(bar a couple stuff I forgot to add at the end like a couple of the Glyphs) image archive of the Hunt The Signal Campaign. i hope those who made it to the end at least get a nice little consolation prize. like that glitch ARG last year. I hope so. I mentioned my similar wishes earlier in the thread. I'm holding out for hopefully a new badge on here. :D This ARG wasn't very easy to figure out for the majority of people (including myself & my team), taking the community many days & several frustrating hours to complete. When I tried to re access hunthesignal it redirected me to HunttheTruth, but it renamed all my Huntthtruth tabs "the TRUTH"
So nobody ever found the 2nd Glyph. What a load of WeeWee. Sooo.. I just remembered about this. Where are your faces guys? I'd have thought 343 would make a mention of this somewhere but I can't find any info. I pm'd Seph (one of the winners) they never got into Halo 5. They are however in The Fall of Reach movie that came with some versions of the game although I don't see anything in the credits. Competitions never seem to deliver on here. Took 6 months to get my Halo 4 t-shirt for that Virgin competition. At least these guys made an appearance but an announcement to the community would have been nice or even an email to all who took part. And an answer to the lost glyph would be good as I still don't know how anyone could have won without it. McCann (the company behind the competition) did run a short video with some really interesting stats. We have it mirrored, but I'll share their site with the details. There were over 16 thousand players that took part, that just blows my mind.